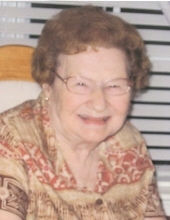 Nellie R. Kueppers, 87, of Chesapeake, passed away Monday, January 21, 2019. Born in Homestead, PA, she was the daughter of the late Horace and Emily Hampson. She was also predeceased by her husband, Richard Kueppers, and her sister, Christine Bunts. Nellie was a Korean War Veteran of the U.S. Army, where she served in the Women's Army Corp. Survivors include two sons, Wayne S. Danner (Kathy), and Donald F. Danner (Lori); grandchildren, Scott (Adrienne), Stephanie, and Derek; great-grandchildren, Alyssa, Julia, Carson and Brayden, as well as nieces, nephews, extended family and friends. A memorial service will be conducted at 6:00 p.m., Wednesday, January 30, 2019 at Oman Funeral Home & Crematory, Chesapeake. A reception will follow the service at the funeral home. The interment will be at a later date in the Albert G. Horton, Jr. Memorial Veterans Cemetery, Suffolk. In lieu of flowers, memorial contributions may be made in Nellie's memory to the SPCA or to a charity of choice. To send flowers or a remembrance gift to the family of Nellie R. Kueppers, please visit our Tribute Store. "Email Address" would like to share the life celebration of Nellie R. Kueppers. Click on the "link" to go to share a favorite memory or leave a condolence message for the family.